A pack of sniffer dogs and metal detectors saved a group of CRPF jawans on a routine morning drill from a powerful landmine near a village in Odisha a few months ago. More than 3,700 people including military personnel have died stepping on landmines planted on or under soil in India in 17 years, a study shows. 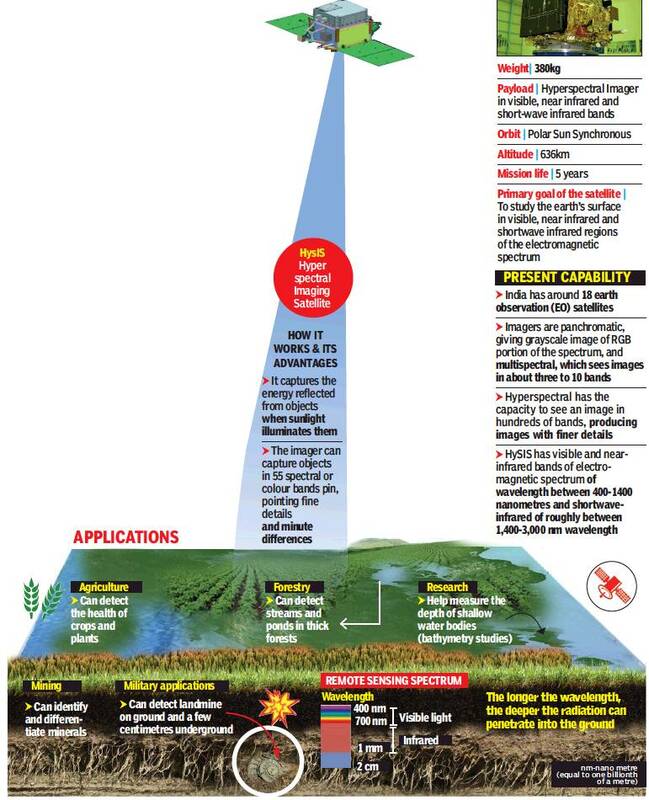 Soon, India’s earth observation satellite HysIS (Hyperspectral Imaging Satellite), launched by a PSLV on Thursday, will do the job of mine mapping minus the risk, from an altitude of more than 600 km in space. Its cameras will look at earth in a whole new way that it would detect tyre tracks on a muddy road and on snow, differentiate a healthy crop from dead ones, spot various minerals at once and locate water streams underneath a thick canopy of trees. “Hyperspectral cameras with near infrared and shortwave infrared capability can penetrate through soil for up to 5 cm, depending on the soil type. It is, however, not as good as a radar that can penetrate deeper by sending wave energy,” said Prof Uday K Khankhoje, department of electrical engineering, IIT Madras. The HysIS camera will work on a visible and near-infrared band with a wavelength between 400 and 1400 nanometres (nm) and shortwave-infrared falling roughly between 1,400 and 3,000 nm. HysIS is better than the existing Indian earth observation satellites as it gives finer details of the objects. “The human eye can see only in a combination of red, green and blue. 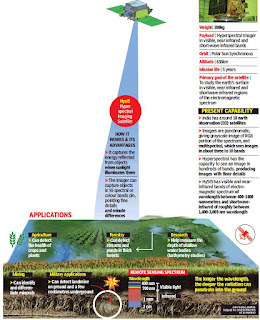 Hyperspectral imagers can see and capture an array of colours present in between any two colours in the electromagnetic spectrum,” said A S Kiran Kumar, former ISRO chairman and a satellite expert. The imager in HysIS can see the earth in 55 spectral or colour bands. This means by looking at, say a patch of land, it can see the soil, what’s immediately beneath, and also if there is a metal or a mineral there. “It can differentiate between a dead plant and a live one. That’s being hyperspectral,” said Khankhoje. On the flip side, HysIS, unlike satellites with synthetic aperture radars, cannot see in the dark. In sunlight, they can see objects as small as one metre. This makes it useful for agriculture, forestry and assessment of coastal zones, inland waters, soil and other geological environments, besides surveillance. A scientist with a national coastal research laboratory said the satellite may help study water quality and map mangroves along the coast. Isro officials said the imager was first tried on board the IMS-1 experimental satellite in 2008. Another hyperspectral camera was sent on Chandrayaan-1 to map lunar mineral resources. At the heart of the satellite is the detector array chip designed by Space Applications Centre, Ahmedabad and made by Semi-Conductor Laboratory, Chandigarh. The chip can read 1,000 x 66 pixels.Only a few countries including the US and China have incorporated this technology into their satellites.